A look back at the early Two Lines publications of these 7 groundbreaking authors. 1) Yoko Tawada has a long history in the pages of Two Lines. Readers of the journal would have first encountered her writing in Issue 8 (2001) with Susan Bernofsky’s translation of “Storytellers Without Souls.” She dazzled us again in Issue 16 (2009) with “The Naked Eye,” again in Bernofsky’s translation. More recently, we dedicated a significant portion of Issue 23 to “The Piper,” a magnificent retelling of the folktale of the Pied Piper, translated from Japanese by Margaret Mitsutani. In the 18 years since we first published her, Tawada has been published widely by both translators and achieved praise from critics throughout the English-speaking world. 2) Fouad Laroui first caught our attention back in 2004, when we published Maureen Lucier’s translation of “A Little Bit of Moroccan Soil” in Issue 11. In 2013, the Moroccan author won the prestigious Prix Goncourt, and in 2016, Deep Vellum published Laroui’s novel The Curious Case of Dassoukine’s Trousers, translated by Emma Ramadan. 3) We were struck by the stunning prose of Argentine writer Samanta Schweblin back in 2010 when we published her short story “Birds of the Mouth” in Issue 17 in Joel Streicker’s translation. 4-6) Issue 19 (2012) first introduced our readers to three authors who would later become Two Lines Press authors: Naja Marie Aidt (Baboon), João Gilberto Noll (Quiet Creature on the Corner and Atlantic Hotel), and Elvira Navarro (A Working Woman). 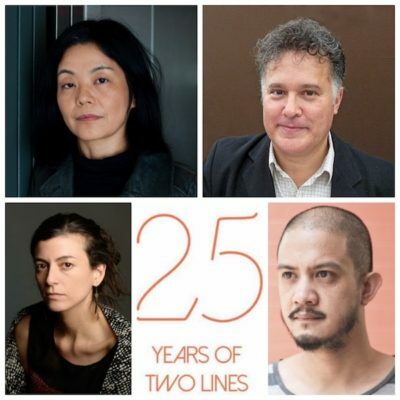 Denise Newman won the 2015 PEN Translation Prize for translating Aidt’s short story collection Baboon, and Noll and Navarro have both developed a loyal readership since the publication of their novels. You can read Noll’s “An English Gent” in our Online Exclusives and pre-order your copy of Lord, our third title by the Brazilian author, which comes out February 12. 7) We published Thai author Prabda Yoon‘s story “Found” in Mui Poopoksakul’s translation in Issue 23 (2015). And you can read Yoon’s “Marut by the Sea” as part of our Online Exclusives. In the years since, Tilted Axis Press has published Yoon’s The Sad Part Was and Moving Parts, both in Poopoksakul’s translation. Speaking of Mui Poopoksakul, we’re publishing her translation of Duanwad Pimwana’s Bright this spring, which will mark the first novel by a Thai female author to be published in the US!